What's the impedance on the Advent/1? Is the Advent/1 an 8 ohm speaker? I don't claim to be an Advent expert but AFAIK there is no such thing as an Advent/1. 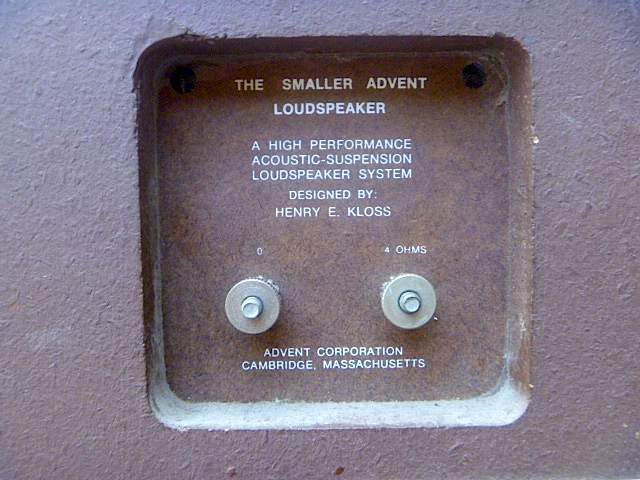 "The Advent Loudspeaker" aka the OLA was 8 ohms. FYI: The Advent/1 was made from 1977 to 1983. It was made to replace the Smaller Advent. It is slightly larger than the Smaller Advent but smaller than the Large Advent. I currently have a pair of Advent/1's. HEY THOMPW: HERE IS AN ADVENT FORUM AND YOU WOULD THINK THAT YOU COULD HAVE YOUR QUESTION ANSWERED, WITH A SIMPLE YES OR NO. THERE ARE ADVENT 1 SPEAKERS, AND I OWN A SET TO CONFIRM MY ANSWER!!! THE SAD THING ABOUT YOUR PREVIOUS RESPONSE IS A SHAME, THAT MIND NOT ENGAGED ALLOWS FLAPPING JUST TO IMPRESS!!! THE TERMINALS ARE MARKED ON THE RIGHT WITH AN #8 AND THE LEFT WITH A #0 SO PRAYERFULLY THIS HELPS YOU OUT. NOW GO AND ENJOY YOUR HEAVENLY MUSIC!!! TAKE CARE MY ADVENT BROTHER!!! FYI: The Advent/1 was made from 1977 to 1983. It was made to replace the Smaller Advent. It is slightly larger than the Smaller Advent but smaller than the Large Advent. I currently have a pair of Advent/1's. Well thanks for the information. As I said--I'm no expert on Advent. Based on your response I did another Google search and found the Advent/1. They are 8 ohm speakers. Apparently there was also an Advent 1 (with no slash). Confusing. Thanks, ITCHIJO, for pointing out what I could have seen but didn't! I looked at my Advent/1's, and sure enough, there's an 8 and a 0 next to the terminals. GREAT!!! NOW YOU CAN BOOGIE ON DOWN THE YELLOW BRICK ROAD OF MUSIC ? AND ENJOY EVERY MINUTE OF IT!!! TAKE CARE AND PLEASE KEEP THE VOLUME TO A MINIMUM!!! In fact, I was just listening to The Yellow Brick Road earlier this evening! I can't promise to keep the volume to a minimum, though. YOU MUST!!! YOU CAN NOT ALLOW YOUR ADVENT SPEAKERS TO BE HARMED!!! GOOD LUCK AND GREAT LISTENING!!! I believe the only Advent to NOT be a nominal 8 ohm load is the Smaller Advent at 4 ohms. Am unable to comment on the entire Advent line, but you're right about the Smaller Advent. NLAs in the Extended position dip to 3.16 ohms at about 6.5 KHz. These are all far lower than 8 ohms. They called them 8 ohm speakers for marketing reasons. Imagine a stacked pair wired in parallel on Extended with a dip well below 2 ohms.